The Pebble Time smartwatch is officially the most funded project in Kickstarter history, raising more than $13.3 million just a week after it launched. The campaign toppled the record set by the Coolest Cooler, a snazzy portable cooler that raised $13,285,226 last year. This isn't the first time the smartwatch maker has held the crown for the No. 1 project on Kickstarter. Pebble's 2012 campaign for its flagship smartwatch was the record holder, raising more than $10 million, before it was outdone by the Coolest Cooler. Pebble's latest campaign also holds the record for the fastest funded project ever, raising $1 million in just 49 minutes. While the campaign had a meteoric rise and was steadily gaining over the last few days, it accelerated today following the announcement of the Pebble Time Steel. The watch, which is available for iOS and Android, has 10 days of battery life (the other Pebble watches have up to seven) and is made out of stainless steel with a scratch-resistant Gorilla Glass lens. The customizable watch will continue to have access to the company's 6,500 (and counting) apps in its app store. An update on the $199 Pebble Steel, which was released last year, backers of the Pebble Time Kickstarter campaign can snap up the new hardware for a reduced price of $250, down from the retail price of $299. Kickstarter backers also have the option to swap out their Pebble Time for a Pebble Time Steel. 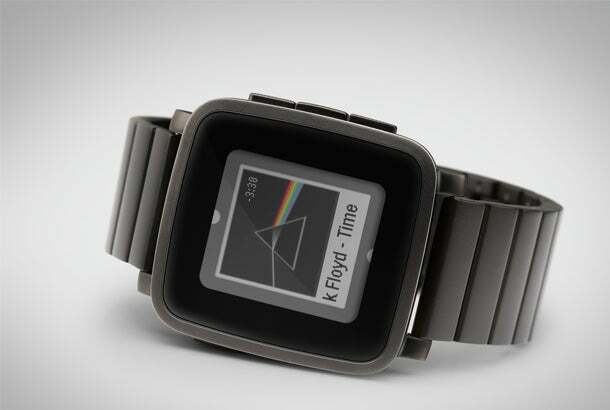 The Pebble Time will begin shipping to customers to May with the Pebble Time Steel to follow in July. Migicovsky also announced an open platform for hardware, similar to the company's app development program. In a statement he explained that the Pebble Time and Pebble Time Steel were designed specifically to be able to integrate with accessories like GPS or a heart rate or pollution monitor, in the form of a "smartstrap."